The primary side effect of adjuvant chemotherapy with taxanes is the chemotherapy-induced peripheral neuropathy (CIPN), which may have substantial negative impacts on patients' quality of life (QOL). Beside chemotherapy dosage modification, the only course of action currently available for dealing with CIPN is symptom management with diverse interventions including opioids, tricyclic antidepressants (TCAs), anticonvulsants, serotonin-norepinephrine reuptake inhibitors (SNRIs), and nonsteroidal anti-inflammatory drugs. Despite early evidence suggesting the ability of gabapentin to treat taxane-induced myalgia, subsequent research found it incapable of making significant improvements in taxane-induced peripheral neuropathy (TIPN) even at higher doses in a 6 weeks trial. Other studies found that pregabalin, is highly effective in diabetic peripheral neuropathy (DPN), hyperalgesia, anxiety, oxaliplatin-induced neurotoxicity, and as a sleep-modulating agent., The effect of pregabalin in TIPN was demonstrated in an animal study, but the clinical evidence of its efficacy on a group of homogenous cancer patients with TIPN is limited. Although the effect of duloxetine and pregabalin on TIPN has been evaluated in the previous studies, comparing this effect has not been investigated yet. Therefore we assessed the effect of pregabalin and duloxetine on QOL of breast cancer patients with TIPN. This randomized, double-blind, Phase III clinical trial carried out at a chemotherapy center of Mazandaran University of Medical Sciences, Sari, Iran. Patients were enrolled and followed up from December 2015 to December 2016. Breast cancer patients 18 or more years old were eligible for enrollment if they received paclitaxel or docetaxel (in an adjuvant or neoadjuvant setting) and experienced Grade 1 or higher neuropathy (based on the National Cancer Institute Common Terminology Criteria for Adverse Events version NCI-CTCAE v4.03) and neuropathic pain score of 4 or more (based on visual analog scale; Visual Analog Scale). The present study was registered by Ethics Committee of Mazandaran University of Medical Sciences (IR.MAZUMS.REC.94-1897). All eligible patients signed an informed consent form before enrollment. The study was submitted and approved by the Iranian Registry of Clinical Trials (IRCT201602112027N5). All procedures performed in studies involving human participants were in accordance with the ethical standards of the institutional and/or national research committee and with the 1975 Helsinki Declaration and its later amendments or comparable ethical standards. Patients with a history of diabetes mellitus or trauma, alcohol consumption, heart, renal or hepatic failure, glaucoma, psychiatric problems (such as major depression, bipolar, and/or suicidal ideation) and being in pregnancy or lactation period were excluded from the study. Furthermore, patients with concomitant use of benzodiazepines, monoamine oxidase inhibitors, gabapentin, and also who received any neurotoxic chemotherapy agents except taxanes were ineligible. Use of Vitamin B12, lamotrigine, sodium valproate, TCAs, pregabalin, and duloxetine were allowed if these drugs were discontinued at least 2 weeks before enrollment the study. In pregabalin (Sobhan Daru, Rasht, Iran) group, patients received 75 mg daily in the 1st week followed by 75 mg twice a day until 6 weeks. In duloxetine (Sobhan Daru, Rasht, Iran) group, patients received 30 mg daily in the 1st week followed by 30 mg twice daily until 6 weeks. The primary outcomes were the mean global health status/QOL, pain, insomnia, and emotional functioning scores after a 6-week treatment period. Secondary outcomes were evaluation of the adverse events (AEs) of the interventions. The degree of TIPN was evaluated by the NCI-CTCAE v4.03 questionnaire. The EORTC QOL (QLQ-C30) questionnaire is one of two prominent instruments for evaluation of QOL of cancer patients. QOL was assessed by the Iranian version of EORTC QLQ-C30 ver. 3.0. The reliability and validity of the Iranian version of the EORTC QLQ-C30 have been approved, previously. The assessment of sensory neuropathy and also QOL were performed at baseline, 3, and 6 weeks after the initiation of the study. The EORTC QLQ-C30 questionnaire consists of five functional scales (physical, role, cognitive, emotional, and social), three symptom scales (fatigue, pain, and nausea and vomiting), a global health status/QOL scale, and six single-item scales (dyspnea, insomnia, appetite loss, constipation, diarrhea, and financial difficulties), all with a 7-day recall period. For the global health status/QOL questions, responses range from 1 (very poor) to 7 (excellent) but for the remaining questions, responses range from 1 (not at all) to 4 (very much). For each subscale, the final score ranges from 0 to 100. Higher scores of the functional scales signify a higher level of functioning; higher scores of the global health status/QOL scale represent higher QOL, and higher scores of symptom scales indicate higher severity of symptoms. According to the results of previous studies,, the total number of subjects required for a two-way parallel trial to detect a treatment effect (improvement was 86% and 59% in pregabalin and duloxetine groups respectively) equal to 0.27 with 5% significance and 80% power and attrition rate equal to 15% was 41 patients. Simple randomization was used to randomize patients to receive either pregabalin or duloxetine. The patients, physicians (oncologist and neurologist) and the evaluator were blinded to assigned treatment. Medications were prepackaged in bottles labeled with random codes generated by a computer. Preparation, packaging, and labeling of the drugs performed by the third person under the supervision of the senior manager of the project. Packaging of the drugs was exactly identical in both arms of the study. The bottle's contents only could be recognized through a key which was solely accessible for the senior supervisor. Recording and processing patients' data also performed using the codes. To evaluate the distribution of the data, Shapiro–Wilk test was done. Descriptive baseline characteristics of patients in two groups were reported as percentages or as median (interquartile range). For analyzing of the continuous variables and categorical variables, t-test, and Chi-square test were used, respectively. The Friedman test was done for the assessment of the dependent data (longitudinal evaluation at three points of time for each group). To assess the independent data (pregabalin and duloxetine in each period), the Mann–Whitney U-test was done. The statistical level of 0.05 or less was considered to be significant. Analysis of the data was done by IBM SPSS statistics (version 16.0, Chicago, USA) and Stata (StataCorp LP. 2013, USA). The CONSORT diagram of the patients is shown in [Figure 1]. From 108 women who experienced sensory neuropathy, 26 were excluded from the study. A total of 82 breast cancer patients were included in this trial between December 2015 and December 2016. The baseline demographic characteristic of the participants is summarized in [Table 1]. There was no significant difference in the baseline demographic characteristics of patients in the pregabalin and duloxetine groups. At baseline, all of the scales of EORTC QLQ-C30 ver. 3.0 were not statistically different between pregabalin and duloxetine groups. The mean difference of global health status/QOL score based on clinical characteristics of the patients, including age, marital status, surgery, radiotherapy, metastasis, timing of study entry, and type of chemotherapy regimen was not statistically significant, respectively (P = 0.55, 0.82, 0.26, 0.63, 0.98, 0.57, and 0.39). At baseline, the mean score of global health status/QOL of patients with neuropathy Grade 1 was higher than Grade 3. The mean difference between two grades was statistically significant (P = 0.009). This finding indicates that patients with higher grade of sensory neuropathy had a worse global QOL. The mean score of pain in neuropathy Grade 1 was less than Grade 2 and Grade 3. The patients with higher grade of neuropathy had more severe pain than the patients with lower grade. The mean difference of insomnia and emotional functioning scores between the grades of sensory neuropathy was not statistically significant, respectively (P = 0.119, and 0.92). Pre- and post-intervention QLQ scores with pregabalin and duloxetine have shown in [Figure 2]a,[Figure 2]b,[Figure 2]c,[Figure 2]d. At baseline, the mean score of global health status/QOL scale for pregabalin group and duloxetine group were 61 (standard deviation [SD]; 5.11) and 60.28 (SD; 5.44), respectively (P = 0.54). The mean score of pain in the pregabalin group and duloxetine group were 45.82 (SD; 9.81) and 42.04 (SD; 12.34), respectively (P = 0.13) (power = 44%). The mean score of insomnia in the pregabalin group and duloxetine group were 53.28 (SD; 16.52) and 49.95 (SD; 16.85), respectively (P = 0.37) (power = 20%). The mean score of emotional functioning in the pregabalin group and duloxetine group was 67.47 (SD; 6.50) and 64.46 (SD; 10.27), respectively (P = 0.12) (power = 40%). In each treatment group, the global health status/QOL scale significant improved after 6 weeks (P = 0.002). However, between pregabalin and duloxetine groups, no significant difference was seen (P = 0.91) (power = 10%). After 6 weeks, the mean score of pain significantly declined both in pregabalin group and duloxetine group (P< 0.001). In comparison to duloxetine, pregabalin was more effective in decreasing of pain score (P< 0.001). After 6 weeks, improvement in the insomnia score was occurred only in pregabalin group (P< 0.001) and the emotional functioning score significantly improved only in patients receiving duloxetine (P< 0.001). Furthermore, we did the analysis on subgroups, however, the results were not significantly different. The AEs were mild and well-tolerated [Table 2]. The type of AEs was statistically different between two study arms. Somnolence and dizziness were more common with pregabalin, whereas nausea/vomiting was more common with duloxetine. Discontinuation of the medication due to AEs did not occur. This study is the first randomized controlled trial (RCT) compares the effect of pregabalin and duloxetine on overall QOL of breast cancer patients experienced neuropathy following taxane chemotherapy. 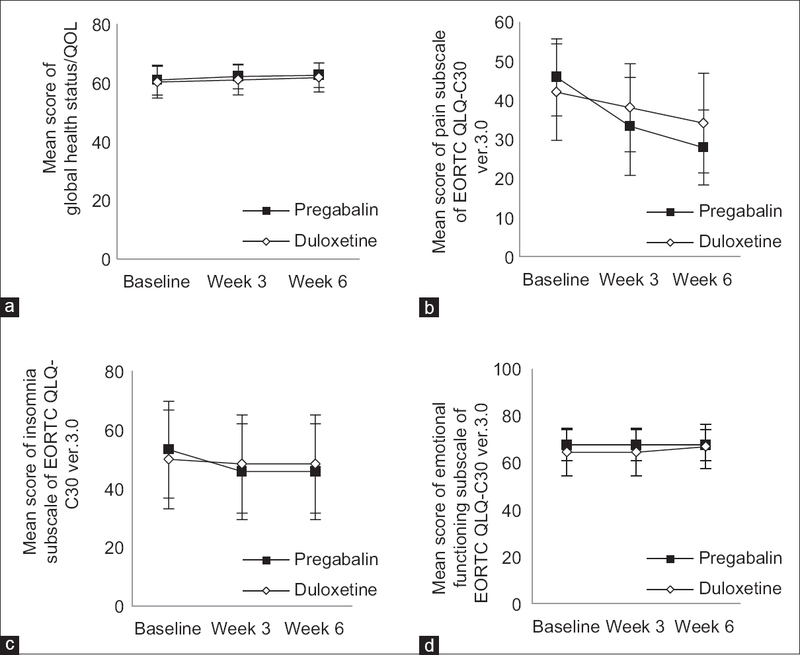 We observed that both pregabalin and duloxetine equally improved the global QOL of patients over a 6 weeks trial. While pain and insomnia domain of QOL were better improved with pregabalin, duloxetine improved emotional functioning subscale of QLQ more than pregabalin. QOL of the cancer patients is negatively affected for a long time, and the patients may suffer from paresthesia and pain even after the completion of chemotherapy. Pain caused by taxanes interferes with daily activities  and may lead to anxiety, depression, cognitive dysfunction, reducing the social activities, and sleep disorders. The association between chemotherapy-induced neuropathy, and QOL was demonstrated with other agents such as oxaliplatin used in the treatment of colorectal cancer. In our study at baseline, the mean score of global health status/QOL scale, pain, insomnia, and emotional functioning subdomain of functional scale were 60.63, 43.88, 51.57, and 65.93, respectively. Our results are comparable with previous studies., Comparing the subscales, the scores of insomnia and pain were higher in our study, as a high percentage of the patients in our study (63%) were on chemotherapy. During receiving chemotherapy, symptoms of the pain and sleep disturbances are more common than after completion of the treatment. We found that patients with higher grade of neuropathy had a worse global QOL. The mean score of global health status/QOL in patients with Grade 1 toxicity was significantly higher than grade 3 (P = 0.009). This indicates that patients in lower grade of sensory neuropathy (NCI-CTCAE) had better global health status score than patients with higher grade. In spite of global QOL, the mean differences of subscales of insomnia and emotional functioning scores between mild and severe grades of sensory neuropathy were not statistically significant. Unlike our study, a trial in colorectal cancer patients found that the EORTC QLQ-C30 subscales were worse in patients with severe neuropathy compared to those with mild neuropathy symptoms. This may be related to a different tool for the assessment of neuropathy, as they used CIPN 20; CIPN20 questionnaire. Tofthagen et al. reported an association between severe oxaliplatin-induced neuropathy with sleep disruption and depressive symptoms in colorectal cancer patients. One explanation for these different results may originate from different measures of assessing depression and disruption of sleep and also this fact that the population of the studies was different. Pregabalin was received approval from food and drug administration in the treatment of DPN and postherpetic neuralgia (PHN). The dosage of 150–600 mg daily of pregabalin was tolerable which led to the improvement of pain and sleep difficulties relating to DPN or PHN. In the present study, we used 75 mg/days of pregabalin in the 1st week followed by 75 mg twice a day for 5 weeks to improve the drug's tolerability. Similar to the effects of pregabalin on sleep disturbances in relation to painful DPN or PHN, we observed improvement in sleep disorder in patients received pregabalin (150 mg/days). In addition to pregabalin, duloxetine has been used to treat the DPN., The dose of duloxetine in our study was 60 mg daily, similar to the recommended dose of duloxetine in DPN. We observed significant improvement in emotional functioning, pain, global health, and QOL domains of EORTC QLQ C-30 questionnaire in duloxetine group. Unlike pregabalin, the insomnia scores of our patients were not significantly improved. Duloxetine was successfully used for the treatment of mood disorder in cancer patients, and it was associated with improvement in global QOL, especially in emotional functioning, pain, global health, and QOL subscales. The effect of duloxetine on QOL in patients receiving neurotoxic chemotherapy agents may be different according to type of chemotherapy agents. It has been reported that duloxetine in patients who received Oxaliplatin was more effective than patients who received taxanes. We realize that the subgroups analysis will be improved with larger RCTs in the future. As other clinical studies, this study suffers from some limitation. One of the limitations is that the evaluation of QOL of patients was done in a relatively short-time period. It is worth to conduct future studies to examine the long-term effects of pregabalin or duloxetine (e.g., use for several months) on QOL of breast cancer with TIPN. Regarding global QOL, both pregabalin and duloxetine were effective in managing TIPN. Pregabalin was significantly more effective in pain and insomnia domains; however, duloxetine was more effective in improvement of emotional functioning subscale of EORTC QLQ–C30. Different effects of treatments on subscale of QLQ-C30 could help clinicians to select the appropriate agent individually. The authors would like to acknowledge the kind assistance and financial support provided by Mazandaran University of Medical Sciences (Proposal ID: 1897 – 20/05/94). This study was financially supported by the Research Deputy of Mazandaran University of Medical Sciences. Iżycki D, Niezgoda AA, Kaźmierczak M, Piorunek T, Iżycka N, Karaszewska B, et al. Chemotherapy-induced peripheral neuropathy – Diagnosis, evolution and treatment. Ginekol Pol 2016;87:516-21. Nguyen VH, Lawrence HJ. Use of gabapentin in the prevention of taxane-induced arthralgias and myalgias. J Clin Oncol 2004;22:1767-9. Rao RD, Michalak JC, Sloan JA, Loprinzi CL, Soori GS, Nikcevich DA, et al. Efficacy of gabapentin in the management of chemotherapy-induced peripheral neuropathy: A phase 3 randomized, double-blind, placebo-controlled, crossover trial (N00C3). Cancer 2007;110:2110-8. Rosenstock J, Tuchman M, LaMoreaux L, Sharma U. Pregabalin for the treatment of painful diabetic peripheral neuropathy: A double-blind, placebo-controlled trial. Pain 2004;110:628-38. Gajraj NM. Pregabalin for pain management. Pain Pract 2005;5:95-102. Saif MW, Syrigos K, Kaley K, Isufi I. Role of pregabalin in treatment of oxaliplatin-induced sensory neuropathy. Anticancer Res 2010;30:2927-33. Peng P, Xi Q, Xia S, Zhuang L, Gui Q, Chen Y, et al. Pregabalin attenuates docetaxel-induced neuropathy in rats. J Huazhong Univ Sci Technolog Med Sci 2012;32:586-90. Pachman DR, Barton DL, Watson JC, Loprinzi CL. Chemotherapy-induced peripheral neuropathy: Prevention and treatment. Clin Pharmacol Ther 2011;90:377-87. Smith T, Nicholson RA. Review of duloxetine in the management of diabetic peripheral neuropathic pain. Vasc Health Risk Manag 2007;3:833-44. Ormseth MJ, Scholz BA, Boomershine CS. Duloxetine in the management of diabetic peripheral neuropathic pain. Patient Prefer Adherence 2011;5:343-56. Smith EM, Pang H, Cirrincione C, Fleishman S, Paskett ED, Ahles T, et al. Effect of duloxetine on pain, function, and quality of life among patients with chemotherapy-induced painful peripheral neuropathy: A randomized clinical trial. JAMA 2013;309:1359-67. Park SB, Goldstein D, Krishnan AV, Lin CS, Friedlander ML, Cassidy J, et al. Chemotherapy-induced peripheral neurotoxicity: A critical analysis. CA Cancer J Clin 2013;63:419-37. Razazian N, Baziyar M, Moradian N, Afshari D, Bostani A, Mahmoodi M, et al. Evaluation of the efficacy and safety of pregabalin, venlafaxine, and carbamazepine in patients with painful diabetic peripheral neuropathy. A randomized, double-blind trial. Neurosciences (Riyadh) 2014;19:192-8. U.S. Department of Health and Human Services. Common Terminology Criteria for Adverse Events v4. 03. Bethesda, MD: National Institutes of Health; 2010. Postma TJ, Heimans JJ. Grading of chemotherapy-induced peripheral neuropathy. Ann Oncol 2000;11:509-13. Aaronson NK, Ahmedzai S, Bergman B, Bullinger M, Cull A, Duez NJ, et al. The European Organization for Research and Treatment of Cancer QLQ-C30: A quality-of-life instrument for use in international clinical trials in oncology. J Natl Cancer Inst 1993;85:365-76. Vondracek P, Oslejskova H, Kepak T, Mazanek P, Sterba J, Rysava M, et al. Efficacy of pregabalin in neuropathic pain in paediatric oncological patients. Eur J Paediatr Neurol 2009;13:332-6. Cascella M. Chemotherapy-induced peripheral neuropathy: Limitations in current prophylactic strategies and directions for future research. Curr Med Res Opin 2017;33:981-4. Fernandes R, Mazzarello S, Hutton B, Shorr R, Majeed H, Ibrahim MF, et al. Taxane acute pain syndrome (TAPS) in patients receiving taxane-based chemotherapy for breast cancer – A systematic review. Support Care Cancer 2016;24:3633-50. Neris RR, Magnabosco P, Amaral PA, Ribeiro MÂ, Anjos AC. 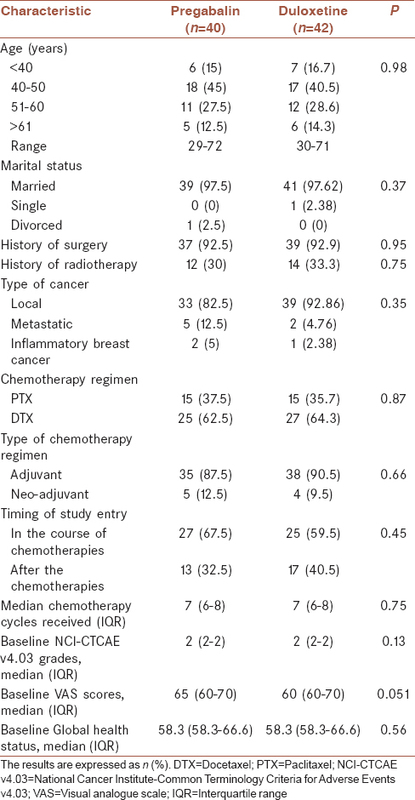 Pain induction by chemotherapy medication docetaxel in women with breast cancer. Acta Paul Enferm 2016;29:397-404. Kim JH, Choi KS, Kim TW, Hong YS. 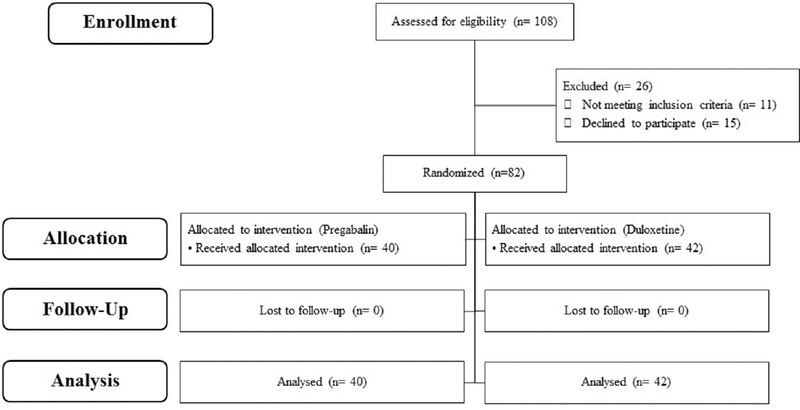 Quality of life in colorectal cancer patients with chemotherapy-induced peripheral neuropathy. J Korean Oncol Nurs 2011;11:254-62. Safaee A, Moghimi-Dehkordi B, Zeighami B, Tabatabaee H, Pourhoseingholi M. Predictors of quality of life in breast cancer patients under chemotherapy. Indian J Cancer 2008;45:107-11. Lôbo SA, Fernandes AF, Almeida PC, Carvalho CM, Sawada NO. Quality of life in women with breast cancer undergoing chemotherapy. Acta Paul Enferm 2014;27:554-9. Cheng KK, Yeung RM. Impact of mood disturbance, sleep disturbance, fatigue and pain among patients receiving cancer therapy. Eur J Cancer Care (Engl) 2013;22:70-8. Mols F, Beijers T, Lemmens V, van den Hurk CJ, Vreugdenhil G, van de Poll-Franse LV, et al. Chemotherapy-induced neuropathy and its association with quality of life among 2- to 11-year colorectal cancer survivors: Results from the population-based PROFILES registry. J Clin Oncol 2013;31:2699-707. Tofthagen C, Donovan KA, Morgan MA, Shibata D, Yeh Y. Oxaliplatin-induced peripheral neuropathy's effects on health-related quality of life of colorectal cancer survivors. Support Care Cancer 2013;21:3307-13. Kumar A, Pottabathini R, Bhatnagar A, Garg S, Gupta V. Pharmacological management of neuropathic pain: Current trends and possible approaches. Arch Neurosci 2017;4:e28998. Roth T, van Seventer R, Murphy TK. The effect of pregabalin on pain-related sleep interference in diabetic peripheral neuropathy or postherpetic neuralgia: A review of nine clinical trials. Curr Med Res Opin 2010;26:2411-9. Cohen K, Shinkazh N, Frank J, Israel I, Fellner C. Pharmacological treatment of diabetic peripheral neuropathy. P T 2015;40:372-88. Torta R, Leombruni P, Borio R, Castelli L. Duloxetine for the treatment of mood disorder in cancer patients: A 12-week case-control clinical trial. Hum Psychopharmacol 2011;26:291-9.